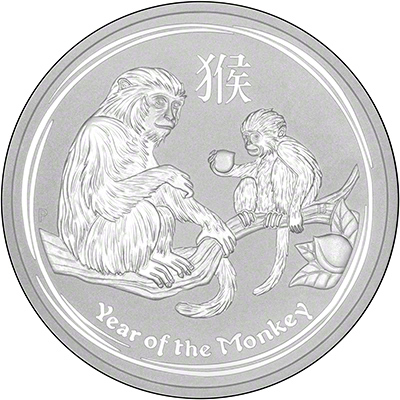 The Australian 'Series Two' 2016 Australian Chinese Lunar Calendar Year of the Monkey silver bullion coins, by the Perth Mint, were released on 5th October, 2015. We received our first delivery of 1/2oz, 1oz and 5oz coins on 15th October, 2015 and the 2oz coins on 21st December. 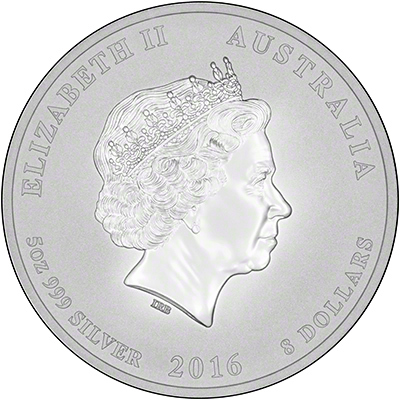 Due to the high demand for silver products, the Perth Mint were forced to delay production on the 10oz and 1kg lunar coins so they could concentrate on other sizes. Production on the coins will recommence shortly, for one last time. So as not to dissappoint distributors, the Perth Mint have allocated a limited amount of the coins to each distributor. Due to the delay, and the limited run on the coins, it means the 2016 10oz silver monkeys and the 2016 1kg silver monkeys have some of the lowest mintage figures of the lunar series. We will not know the exact figure until later in the year. We received our stock of the coins on Wednesday 6th July, 2016. The Year of the Monkey officially starts on February 8th, 2016. It is the Chinese year 4714. The monkey is the 9th animal in the lunar cycle. People born in the Year of the Monkey are said to be intelligent, ambitious and adventurous. They can however have a mischievous side. The reverse design shows an adult and baby monkey sitting in a peach tree. The baby is holding a peach, which is said to represent immortality. 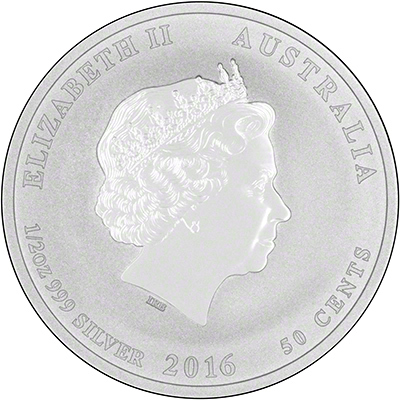 The obverse features the Ian Rank-Broadley fourth portrait of Queen Elizabeth II. Even though a fifth portrait was of the Queen was unveiled in 2015, the coins still feature the fourth portrait, so as to keep them the same as other coins in the series. The one ounce coins have a mintage figure of just 300,000. As in previous years, we expect the one ounce coins to be extremely popular. The 1 kilo, 10oz, 5oz, 2oz and 1/2oz coins will be produced on a "mint-to-order" basis, meaning there is no limit to the amount that will be produced. Once production closes at the end of 2016, the Perth Mint will announce each of the different sizes official mintage figures. A maximum of 150 10 kilo coins were produced on a mint-to-order basis, but sold out within days of their release. 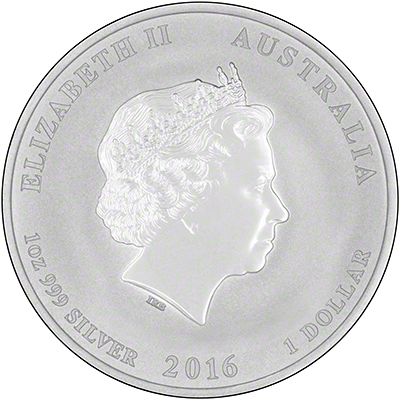 Australia first issued a one ounce silver bullion coin, the Kookaburra, in 1990. In 1999, it was decided to issue a silver Chinese Lunar Year series of silver bullion coins, following the success of the gold versions which started in 1996. 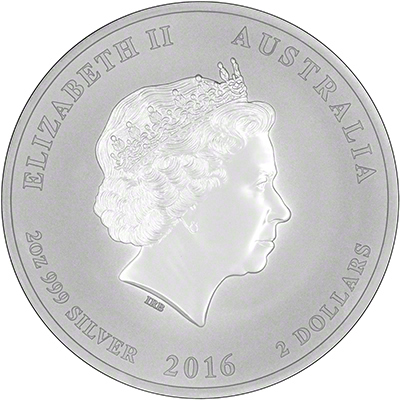 For detailed specifications, please see our Specifications of Australian Silver Bullion Coins page. Many people ask us for next year's coins in approach of Chinese New Year. The Australian coins are made to very high standards of design and production. Each coin also comes in its own protective plastic capsule. We will have the 2016 Australian Silver Kookaburras in stock. We will have the year 2016 Australian Silver Koalas in stock. We will have the year 2016 Australian Silver Kangaroos in stock.